This post gives an example of ground-floor living as part of a local/neighbourhood/suburban-sized shopping centre. 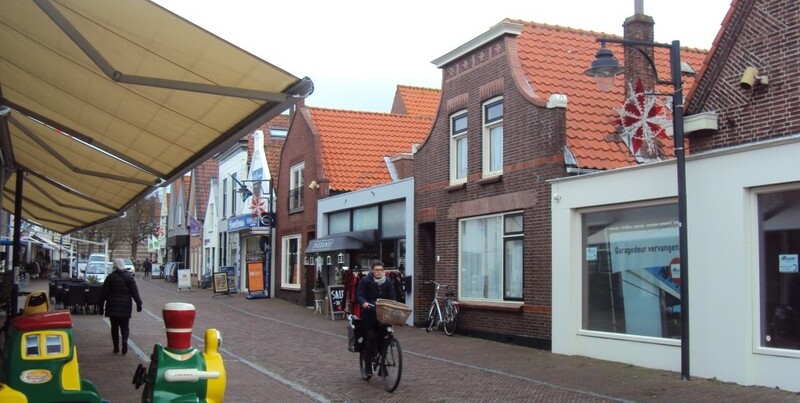 The South Holland village of Ouddorp provides for a local population of about 6,000 people. The village centre has a good number of shops on the streets surrounding its central church. It also has a similar number of ground floor residential dwellings side by side with these shops and restaurants. “a contraction of such centres [Local Shopping] is anticipated … In an effort to speed this process residential dwellings of a similar type to those in the adjacent residential zone are to be permitted [in commercial zone 1: Local Shopping]” (ref 1 for context). Ouddorp appears to “allow maximum flexibility in land use so that buildings get renovated and economic activities take place to pay the taxes to maintain a high level of services” (ref 2). The outcome of Ouddorp allowing residential dwellings on primary frontages made photographing the more mixed primary frontages a bit odd. Normally it is easy to snap a quick photo in a public place and move on, which I did in the above photos. However, when I tried this in Ouddrop’s most commercial frontages, the residents there lived with their curtains fully open, so I was taking photos of people more than of the building. These residents ‘people-watch’, just the way people sitting at a cafe table eating and drinking do. Getting back to the Hamilton ODP, here is a question for city leaders: when does ground floor residential detrimentally affect retail business? “This is a zone designed to provide for shops that will be able to meet the day to day shopping requirements of localized areas that are within easy walking distance. In view of the structure of the proposed hierarchy, provision has only been made for those retail activities providing the basic everyday services. However, in recognition of the existence of some non-retail service activities in proposed Commercial 1 zones, provision has also been made for a limited number of auxiliary service facilities such as hairdressing salons. It is anticipated that with the development of Commercial hierarchy, the role of this zone [Local Shopping], and service which it will offer, will be able to be taken over in many instances by the single unit dairy grocery. The Commercial 1 centres [Local Shopping] will service a population of approximately 1,000 within a 400m radius. It is intended that a gross retail floor-space of between 100 and 200m2 will be the typical scale.